Tooth, Pulp - Thrombus in a female F344/N rat from a subchronic study. 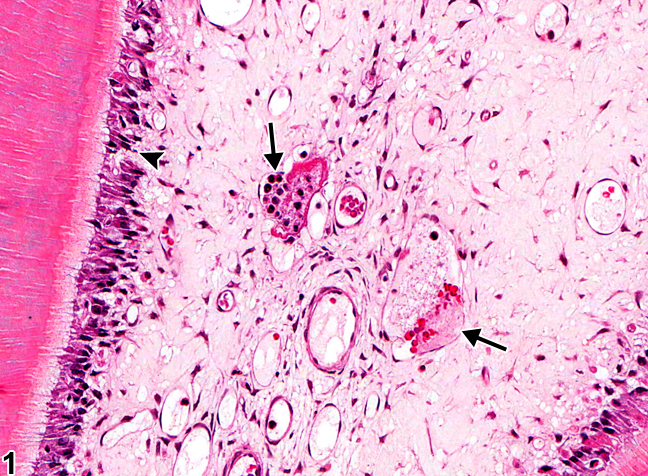 There are thrombi within vessels in the pulp (arrows) and degeneration of odontoblasts (arrowhead). Tooth, Pulp - Thrombus in a female F344/N rat from a subchronic study. A small thrombus is present in the tooth pulp (arrow). 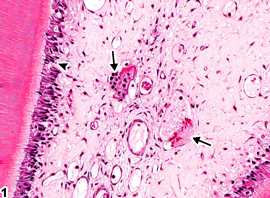 Thrombosis of vessels in the tooth pulp ( Figure 1 and Figure 2 , arrows) can result in infarction of the pulp and odontoblast degeneration ( Figure 1 , arrowhead) and necrosis. 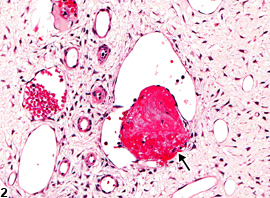 Thrombosis specifically of vessels in the tooth pulp has not been seen in NTP studies, but it has been seen with disseminated, chemically induced thrombosis in which thrombi were identified in multiple organs. Mechanisms that may be involved in the pathogenesis of chemically induced thrombosis include vascular damage and disturbance of blood flow. Vascular occlusion generally results in ischemic necrosis of the pulp and death of the tooth. Vascular thrombi in the tooth pulp should be diagnosed and graded based on their size and number. Associated infarction or necrosis or degeneration of the odontoblasts or other cells should be diagnosed and graded separately. The relationship between the necrosis/degeneration components of the tooth and the thrombi should be made clear in the pathology narrative. Nyska A, Maronpot RR, Long PH, Roycroft JH, Hailey JR, Travlos GS, Ghanayem BI. 1999. Disseminated thrombosis and bone infarction in female rats following inhalation exposure to 2-butoxyethanol. Toxicol Pathol 27:287-294. Zbinden G, Grimm L. 1985. Thrombosis effects of xenobiotics. Arch Toxicol 8(suppl):131-141.